Miners, digging far into the Earth's crust, stumble across a clutch of radioactivity-modified giant insects a taste for human flesh. These insects turn out to be the primary food source of a giant prehistoric pteradactal, Rodan, which awakens to terrorize the entire world. 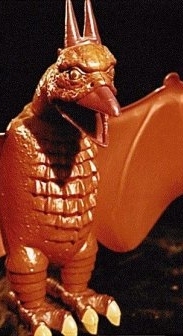 Rodan is the rarest (of the US releases) and probably the most desirable and valuable (unreleased in Japan, many Japanese collectors search and buy up this great toy!). 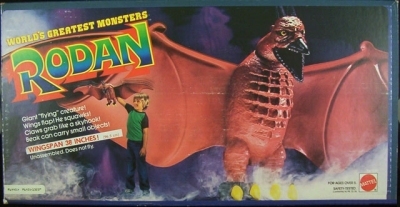 Billed as one of the "World's Greatest Monsters" and released in 1980, Rodan is collected by cross-genre toy collectors, making it hard to acquire. I've included Rodan as it obviously is in the same scale as Godzilla and could fight all the Shoguns (making it the villain to the line, I guess...this is suggested in the comic book ad). There are some paint variations in the figure (the stripe on his nose varies slightly in color and size). There are at least 3 box variations that I've either seen or heard of. Rodan is copyright ©2003 TOHO Co., LTD. All Rights Reserved.